Kiev (/ˈkiːɛf, -ɛv/ KEE-ef, -ev) or Kyiv (Ukrainian: Київ, translit. Kyiv [ˈkɪjiu̯] ( listen); Old East Slavic: Кыѥвъ, translit. Kyjev; Polish: Kijów Polish pronunciation: [ˈkʲijuf]; Russian: Киев, translit. Kiyev [ˈkʲiɪf]) is the capital and largest city of Ukraine, located in the north central part of the country on the Dnieper. The population in July 2015 was 2,887,974 (though higher estimated numbers have been cited in the press), making Kiev the 7th most populous city in Europe. 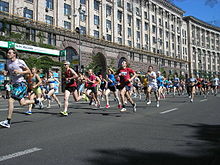 Currently, Kiev is the traditional and most commonly used English name for the city. The Ukrainian government however uses Kyiv as the mandatory romanization for use in legislative and official acts. 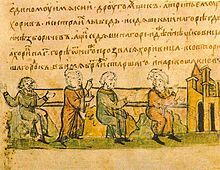 Early English sources use various names, including Kiou, Kiow, Kiew, Kiovia. On one of the oldest English maps of the region, Russiae, Moscoviae et Tartariae published by Ortelius (London, 1570) the name of the city is spelled Kiou. 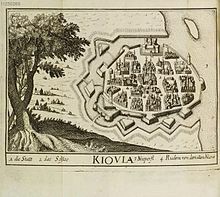 On the 1650 map by Guillaume de Beauplan, the name of the city is Kiiow, and the region was named Kÿowia. In the book Travels, by Joseph Marshall (London, 1772), the city is referred to as Kiovia. The name Kiev that started to take hold at later times is based on Russian orthography and pronunciation [ˈkʲijɪf], during a time when Kiev was in the Russian Empire (from 1708, a seat of a governorate). Kiev City State Administration official request for Wikimedia Foundation to switch to "Kyiv" from "Kiev". Kyiv ([ˈkɪjiw]) is the romanized version of the name of the city used in modern Ukrainian. Following independence in 1991, the Ukrainian government introduced the national rules for transliteration of geographic names from Ukrainian into English. According to the rules, the Ukrainian Київ transliterates into Kyiv. This has established the use of the spelling Kyiv in all official documents issued by the governmental authorities since October 1995. The spelling is used by the United Nations, all English-speaking foreign diplomatic missions, several international organizations, Encarta encyclopedia, and by some media in Ukraine. In October 2006, the United States federal government changed its official spelling of the city name to Kyiv, upon the recommendation of the US Board of Geographic Names. The British government has also started using Kyiv. The alternate romanizations Kyyiv (BGN/PCGN transliteration) and Kyjiv (scholarly) are also in use in English-language atlases. Most major English-language news sources like the BBC, The Economist, and The New York Times continue to prefer Kiev. In the early 1320s a Lithuanian army led by Grand Duke Gediminas defeated a Slavic army led by Stanislav of Kiev at the Battle on the Irpen' River and conquered the city. The Tatars, who also claimed Kiev, retaliated in 1324–1325, so while Kiev was ruled by a Lithuanian prince, it had to pay tribute to the Golden Horde. Finally, as a result of the Battle of Blue Waters in 1362, Algirdas, Grand Duke of Lithuania, incorporated Kiev and surrounding areas into the Grand Duchy of Lithuania. In 1482 Crimean Tatars sacked and burned much of Kiev. With the 1569 (Union of Lublin), when the Polish–Lithuanian Commonwealth was established, the Lithuanian-controlled lands of the Kiev region (Podolia, Volhynia, and Podlachia) were transferred from the Grand Duchy of Lithuania to the Crown of the Kingdom of Poland, and Kiev became the capital of Kiev Voivodeship. 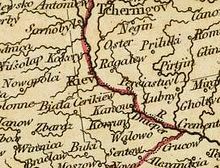 The 1658 Treaty of Hadiach envisaged Kiev becoming the capital of the Duchy of Rus' within the Polish–Lithuanian–Ruthenian Commonwealth, but this provision of the treaty never went into operation. Occupied by the Russian troops since the 1654 (Treaty of Pereyaslav), Kiev became a part of the Tsardom of Russia from 1667 on (Truce of Andrusovo) and enjoyed a degree of autonomy. None of the Polish-Russian treaties concerning Kiev have ever been ratified. 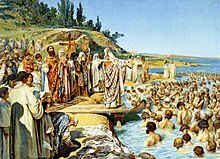 In the Russian Empire Kiev was a primary Christian centre, attracting pilgrims, and the cradle of many of the empire's most important religious figures, but until the 19th century the city's commercial importance remained marginal. During the Russian industrial revolution in the late 19th century, Kiev became an important trade and transportation centre of the Russian Empire, specialising in sugar and grain export by railway and on the Dnieper river. By 1900 the city had also become a significant industrial centre, having a population of 250,000. Landmarks of that period include the railway infrastructure, the foundation of numerous educational and cultural facilities as well as notable architectural monuments (mostly merchant-oriented). In 1892 the first electric tram line of the Russian Empire started running in Kiev (arguably, the first in the world). 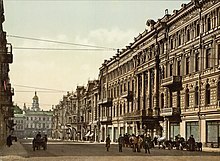 Kiev prospered during the late 19th century Industrial Revolution in the Russian Empire, when it became the third most important city of the Empire and the major centre of commerce of its southwest. In the turbulent period following the 1917 Russian Revolution, Kiev became the capital of several successive Ukrainian states and was caught in the middle of several conflicts: World War I, during which German soldiers occupied it from 2 March 1918 to November 1918, the Russian Civil War of 1917 to 1922, and the Polish–Soviet War of 1919–1921. Kiev changed hands sixteen times from the end of 1918 to August 1920. Because the city boasts a large and diverse economic base and is not dependent on any single industry and/or company, its unemployment rate has historically been relatively low – only 3.75% over 2005–2008. Indeed, even as the rate of joblessness jumped to 7.1% in 2009, it remained far below the national average of 9.6%. The average monthly net salary in Kiev reached €330 as of 2017. Kiev hosts many universities, the major ones being Kiev National Taras Shevchenko University, the National Technical University "Kiev Polytechnic Institute",, Kyiv-Mohyla Academy and the Kyiv National University of Trade and Economics. Of these, the Mohyla Academy is the oldest outright, having been founded as a theological school in 1632, however the Shevchenko University, which was founded in 1834, is the oldest in continuous operation. The total number of institutions of higher education in Kiev currently approaches 200, allowing young people to pursue almost any line of study. While education traditionally remains largely in the hands of the state there are several accredited private institutions in the city.